In the heart of an ancient, mysterious forest, ruins of an enchanted city are waiting, drowned in deep silence. Suddenly, a huge Troll rises from the tangled vegetation, while malicious Dryads are luring the heroes, so to wrap them in a deceitful embrace. Bunches of Gnomes are preparing their ambushes, while the Phoenix flames offer a hot welcome to the adventurers. However, the Enchanted Reign cannot flourish without the consent of the mighty Archmage: surely, the magic arts of the fairy Land will be a precious adding to the MiniMonFa menagerie! 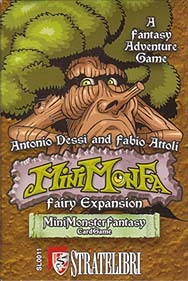 The MiniMonFa Card Games' Fairy Expansion contains a crowd of incredible creatures you can use to fill your dungeons, six brand new heroes - such as the charming Fairy, the powerful Centaur, The brave Warrior Elf and the skilled Thief Elf - and new magic items, unique Fairy abilities, new Trap cards!